You'll find the Cap and Pence and Copper/Silver coins in some of the earliest books in magic's literature, including The Discoverie of Witchcraft and Hocus Pocus Jr. That they've been prominently represented in the repertoires of magicians ever since is a testament to how potentially strong the magic created with them can be. 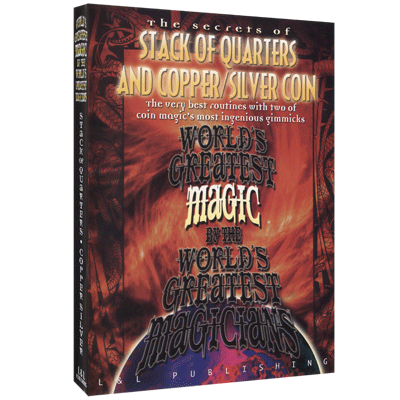 On this volume, three modern masters demonstrate and teach varying and powerful uses for the Stack of Quarters and Copper/Silver gimmicks. David Roth dispenses with the leather cone for the classic Cap and Pence presentation, using a rolled-up dollar bill to produce a miracle using a spectator's hand and some borrowed quarters. Johnny Thompson takes the same effect and adds some of Nate Leipzig's touches to increase its impact. David Roth demonstrates and teaches the classic Copper/Silver transposition and then he and Johnny Thompson each take on Presto Chango, where two coins repeatedly turn from copper to silver at the magician's will. Finally, Michael Close rounds out the set with his version of the Copper/Silver Transposition with some fine touches that will make your spectator believe that coins really are passing right through their hand.